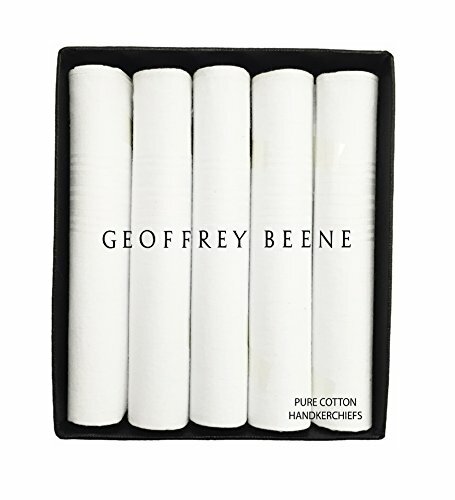 Geoffrey Beene 5 Pack Handkerchiefs (White) | What Should I Say? Function and Fashion meet in this 5 pack of white handkerchiefs that feature a solid design. They are made of 100% woven cotton. Whether Its a Classy pocket square or the old school Cleaning Handkerchief you're looking for, these Handkerchiefs do it all. These Clean looking Solid Whites are the perfect purchase. Tonal stripes pattern soft, absorbent handkerchiefs cut from pure cotton. If you have any questions about this product by Geoffrey Beene, contact us by completing and submitting the form below. If you are looking for a specif part number, please include it with your message.